Assam - A land nestled in myths and mysteries, lore’s and legends. Assam is almost another world, the gateway to the eastern states, the coloured wonderland of India. 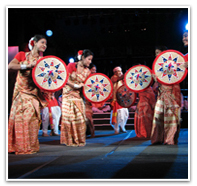 The most important festival of Assam is the Bihu, the Assamese New Year Celebrations. This major festival of Assam is celebrated in three forms, the Bohag Bihu or Rongali Bihu in April, Magh Bihu or Bhogali Bihu in January and Kati Bihu or Kongali Bihu in October/ November. The most colourful is the Spring-Festival, Rongali Bihu, celebrated in mid- April. Essentially a festival mar king the beginning of an agricultural season, the people of Assam enjoy it with dancing and singing. Bhogali Bihu, the harvesting festival is celebrated in mid- January by community feasts.